Johann Pachelbel's most famous piece, the Canon in D was written around 1680, during the Baroque period, as a piece of chamber music for three violins and basso continuo, but has since been arranged for a wide variety of ensembles. The piece, whose score was discovered and first published in the 1920s, and first recorded in 1940 by Arthur Fiedler, is particularly well known for its chord progression, and is played at weddings and included on classical music compilation CDs. It became very popular in the late 1970s through a famous recording by the Jean-François Paillard chamber orchestra. The actual canon is played by three voices over the ground bass. In the beginning, the flute plays the first two bars of the canon's melody. At this point, the second voice enters with the beginning of the melody, whilst the flute continues with the next two bars of the canon. Then the third voice commences the canon, whilst the second voice plays the third and fourth bars and the flute continues with the fifth and sixth. The three voices then follow one another at two bars' distance until the end of the piece. The canon becomes increasingly dense towards the middle of the piece as the note values become shorter; afterwards, the piece gradually returns to a less complex structure as the note values lengthen once more. There are 28 repetitions of the ground bass in total. In our arrangement we adapted the first voice to the range of the flute, leaving the second and the third voice with the original melody. 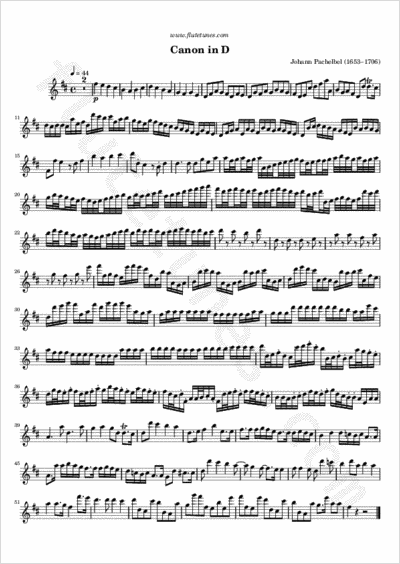 If you want, the piece can be played as a flute duet or trio: all you need to do is to play multiple instances of the flute part at two bars' distance. American film director Robert Redford used the piece as the main theme for his 1980 Academy Award-winning film Ordinary People.